“In Canberra the orthodox view remains that an independent Bougainville would complicate Australia’s strategic environment. It could destabilise both Papua New Guinea and Solomon Islands, and would inevitably be a weak and possibly internally conflicted state requiring substantial external assistance for an extended period, with this cost being largely borne by Australia. 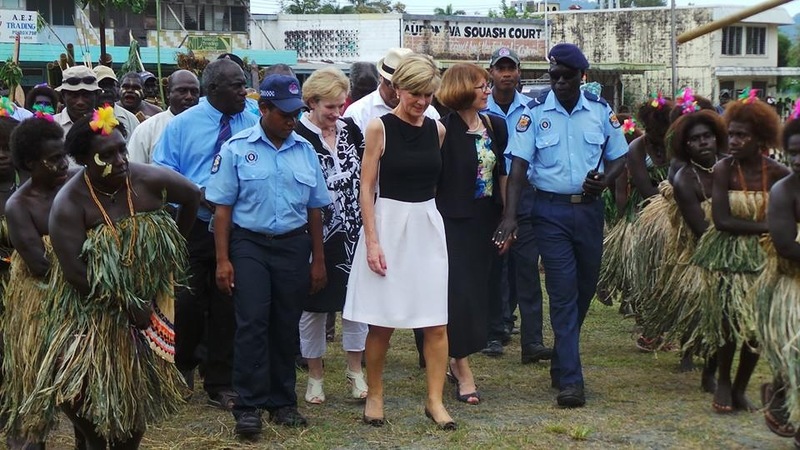 Picture Above Arawa 2014: Australia’s Foreign Minister Julie Bishop has taken a personal interest in Bougainville. The 2001 Bougainville Peace Agreement (BPA) marked the formal end to the 1990s Bougainville conflict, even though a truce, and subsequently a ceasefire, had been in place since late 1997. Among other things, the BPA provided for a delayed referendum on Bougainville’s future relationship with Papua New Guinea. Under an agreed formula, the referendum will be held between June 2015 and June 2020. There are now clear risks, however, that the BPA mightn’t last the distance. This post looks at where things are headed on Bougainville and, in particular, at some difficult choices the Australian Government may need to make in the coming period. Foreign Minister Julie Bishop has taken a personal interest in Bougainville, having visited it both in opposition and in government. She’s been careful to avoid commenting on the independence question although there’s no reason to think that the Abbott Government’s approach will be different from that of its predecessors; it will have a strong preference for Bougainville to remain part of Papua New Guinea. In Canberra the orthodox view remains that an independent Bougainville would complicate Australia’s strategic environment. It could destabilise both Papua New Guinea and Solomon Islands, and would inevitably be a weak and possibly internally conflicted state requiring substantial external assistance for an extended period, with this cost being largely borne by Australia. The counter-argument—that a peaceful separation of Bougainville from the rest of Papua New Guinea would settle once and for all what has been an issue for all of Papua New Guinea’s history as an independent country—is rarely heard. For all that, Australia’s formal position on Bougainville’s independence is in fact one of neutrality. This position was first set out in March 2000 by then-Foreign Minister Alexander Downer. During the course of negotiations on the Bougainville Peace Agreement, Downer announced that Australia would ‘accept any settlement negotiated by the parties’. Downer never made any secret of the fact that Australia’s preference was for Bougainville to remain part of Papua New Guinea. Even so, his March 2000 announcement was seen—particularly on Bougainville—as a significant change in Australian government policy because it meant, in theory at least, that Australia was open to any negotiated outcome, including independence. Previously, during the course of the Bougainville crisis from 1988 onwards, Australia’s position had been that Bougainville was an integral part of Papua New Guinea; that position was part of the reason for strong anti-Australian sentiment among pro-independence leaders on Bougainville. The perception of a significant policy change was reinforced by Downer’s role, later in 2000, in helping to broker the crucial ‘delayed referendum’ provisions of the Bougainville Peace Agreement (BPA). These provide for an independence referendum 10 to 15 years after the election of a Bougainville government (as it subsequently turned out, this means June 2015–June 2020), plus a requirement for the outcome to be ratified by the PNG Parliament. Downer argued that this outcome gave reassurance to both sides: for pro-independence Bougainvilleans a successful referendum, although non-binding, would have irresistible moral force among the international community; for the PNG government, at the same time, sovereignty would ultimately be preserved by giving the PNG Parliament the final say. The Referendum shall be held … not earlier than 10 years and, notwithstanding any other provision [emphasis added], not more than 15 years after the election of the first Bougainville Government. Australia took as a given that PNG governments of any stripe would want Bougainville to remain part of Papua New Guinea—and that they would (and should) take advantage of the delay in the timing of the referendum to convince Bougainvilleans of the benefits of autonomy over independence. Whatever Papua New Guinea’s efforts over the years since the BPA was signed, most informed observers would now take the view that majority Bougainvillean opinion remains firmly pro-independence, even if differences exist on the question of how ready Bougainville is for independence and therefore on the best timing for this. Campaigning for the May 2015 elections in Bougainville was conducted explicitly on the grounds that the incoming government (which has a five year term) would be the one to negotiate the exact timing of the referendum. All presidential candidates, including the winner, John Momis, were pro-independence in outlook. The PNG government hasn’t publicly walked away from the BPA; on the contrary, it continues to assert its commitment to it. The communiques from successive PNG–Australia Ministerial Forums continue to include routine (perhaps by now ritual) affirmations of the PNG government’s ‘ongoing commitment to the full implementation of the Bougainville Peace Agreement’. It would be prudent at least to contemplate ways in which all this could go wrong. Papua New Guinea’s reaction to the May 2015 budget announcement that an Australian consulate would be established in Buka suggested that Australia had touched a raw nerve in Waigani, and gave a valuable insight into the importance and sensitivity of this issue for the O’Neill government. Certainly, the Port Moresby rumour mill increasingly suggests that Prime Minister O’Neill is giving serious thought as to how Papua New Guinea can preserve its interests in Bougainville in the long term. Many on Bougainville fear that the PNG government will find a way to prevent the referendum from going ahead at all. So it’s at least possible that Bougainville and Waigani may be on a collision course. In a second post I will look at the implications of any such collision for Australian policy.